One of the largest shopping sites in the Poconos! Established in 1986, we are located at 2523 Milford Road in East Stroudsburg, Pennsylvania in Northeastern Pennsylvania, in the heart of the beautiful Pocono Mountains. For over 30 years, vacationers to the Poconos, as well as residents, have enjoyed our unique retail store, featuring candy, candles, collectibles and crafts. 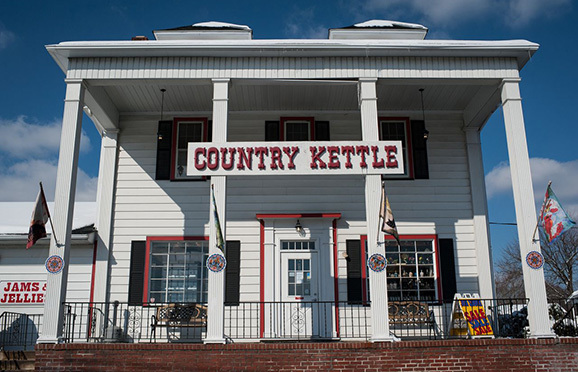 Considered one of the largest shopping attractions in the Poconos, Country Kettle, like so many "bricks & mortar" retailers, has now established itself as a world-wide distributor, thanks to the Internet. We are close to several Pocono Mountains attractions including the Shawnee Inn & Golf Resort and Shawnee Mountain Ski Area, The Villas at Fernwood, Bushkill Falls, and MORE. Stop by and discover a unique shopping experience at Country Kettle!